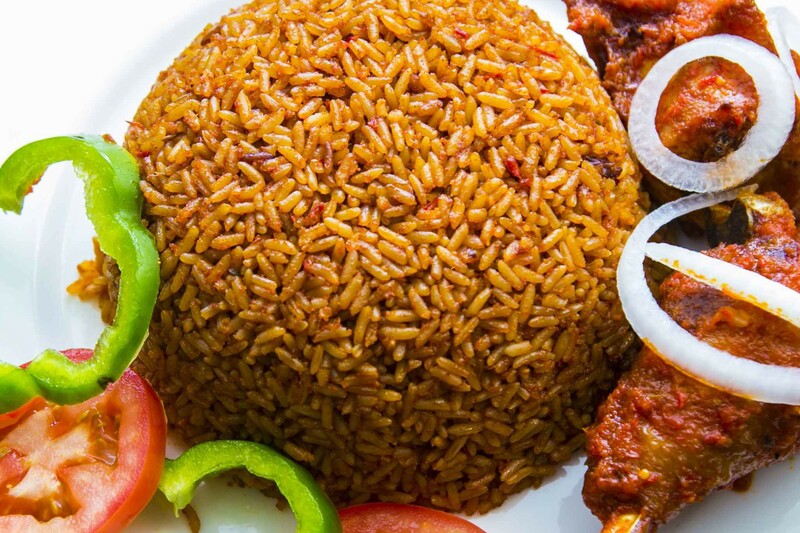 Jollof rice is a great favorite all over West Africa. 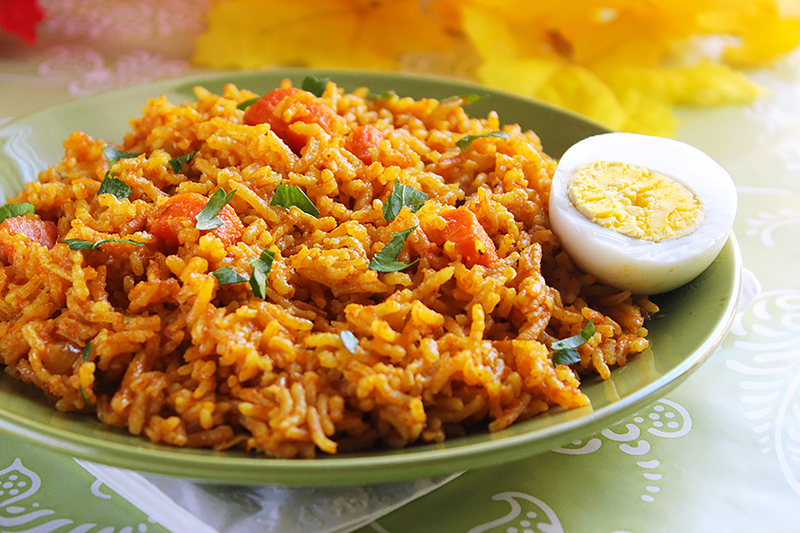 The name Jollof rice is derived from the name of the Wolof people. In some places, Jollof rice is known as Benachin, which means “one pot”. This West African dish is consumed throughout the regions of Nigeria, Ghana, Gambia, Senegal, Cameroon, Liberia, Coast, Mali, Togo, Sierra Leone, and Ivory. 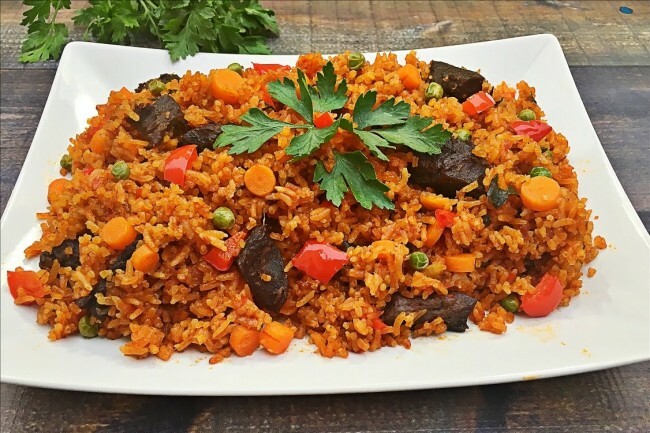 The recipe differs from one region to another but the main ingredients of Jollof rice are rice and tomatoes. Jollof rice is a simple, spicy one-pot dish comprising, at its most basic, rice, tomatoes, tomato paste, chili peppers, onions, pepper, salt and spices such as for as nutmeg, ginger, Scotch bonnet, and cumin. The dish is always color red due to the tomato paste and palm oil. Tomatoes also play a primary role in rice and provide a good amount of vitamins and minerals. Optional ingredients can be added such as vegetables, meats, or fish. Jollof rice is a celebration dish in West Africa so it is often served at parties, ceremonial occasions, and other festive gatherings. Add oil and butter in a heat resistance pot, then add the chicken breast, paprika, cayenne, onion, celery, green pepper, garlic, and ginger. Saute for about 3 minutes. Add the chopped carrots next and saute for a minute with a little salt. Add the tomato paste, tomatoes along with curry powder, bay leaf & thyme. Cook until tomatoes get slightly soft. For about 3 minutes until you see the oil getting red. Then add frozen veggies. Add the rice next. Saute for another 2 minutes or so. If rice is still little hard, add 1/4 cup water and cover with foil, which will allow it to steam through. Check back at 5 min and It should be ready. You want your rice not too soft. Piripiri chicken is among the most favorite South Africa recipes that is generally made out of piripiri peppers. Also, it is known as PeriPeri chicken in South Africa. The dish was made in Angola and Mozambique at the time Portuguese settlers came having chile peppers (referred to as piri-piri in Swahili). 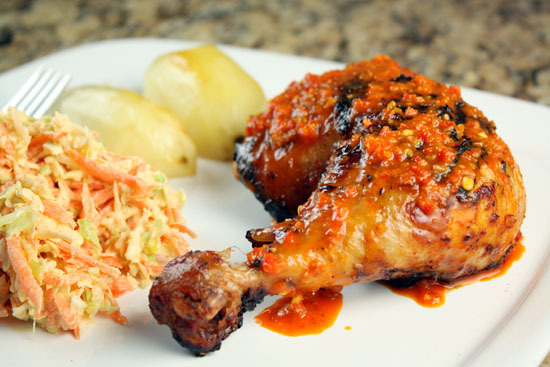 The chicken must be marinated for around 4 hours prior to being barbecued or grilled. Melt butter on tiny saucepan through medium-high heat. Put garlic and cilantro; cook till garlic clove starts to brown, around 2 minutes. Put piri-piri sauce and fresh lemon juice. Minimize heat to medium-low; cook two minutes. Glaze can be done as much as one day in advance. Cover up and let it cool. Rewarm prior to using. Chop shallot, cilantro, ginger, as well as garlic on processor. Put in piri-piri sauce, fresh lemon juice, 1/4 cup oil, pepper, and coarse salt; process marinade to mix. Put chicken with skin side up, in work area. Employing hand, push on breastbone in order to flatten chicken. Put wing tips below. Fill in 1 / 2 of marinade into 11x7x2-inch glass baking bowl. Open up chicken similar to book; put skin area down on one layer in dish. Put left over marinade above. Cover up; cool around four hours or overnight, flipping chicken from time to time. Take out top rack through barbecue. Cook barbecue (moderate heat). In case utilizing 2-burner grill, light one burner. In case utilizing 3-burner grill, don’t light middle burner. In case utilizing charcoal grilling, light briquettes on chimney and put into one side of lower grill rack. Put disposable aluminum pan in unlit portion of grill. Put upper grill tray in barbecue; lightly brush using oil. Take out chicken out of marinade. Line up skin side on grill rack over drip pan. Cover up barbecue; grill till skin is browned and then instant-read thermometer put into thickest section of thigh registers 165°F, flipping regularly, around 40 minutes. Move to plate. Put warm glaze around. The rich and creamy fish curry with simply enough spice, power it up with sweet potato and spinach to get you on your way to have a great and healthy day. You can now make the most perfect curry right now, because of so many excellent curry pastes accessible in the stores. Just add in coconut milk, a lot of fresh cilantro leaves as well as basmati rice! 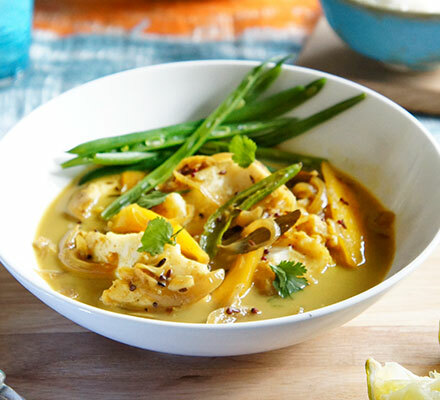 This particular recipe consists of coconut milk and curry powder put together in a sauce for chunks of white fish as well as chopped tomato on a quick and easy steps! Top the fish fillets along with the curry paste and then leave it to marinate for approximately an hour or so. Heat up the oil and fry the marinated fillets for a few minutes. Take them out from your pan and add some red onions and fresh mushrooms. Fry till it cooked properly and season with pepper and salt. So now add some peeled and chopped tomatoes, return back the fish into the saucepan and add some coconut milk. Allow the curry cook for as much as ten minutes or till the fish is cooked properly. Add some basil or cilantro leaves. Serve together with the basmati rice. Make use of chicken as an alternative to fish. Don’t overcook the fish since it will break apart. This particular national dish of South Africa is actually a tasty blend of curried meat as well as fruit along with a creamy golden topping. This embraces not just local flavors, but as well as the unique flavors which spice traders delivered to the Cape at their travels. Bobotie is very easy to cook in advance and it is always a crowd pleaser. 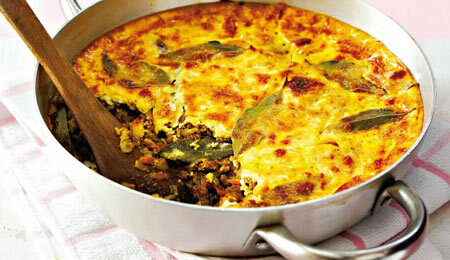 You can find as numerous variations for bobotie as you can find cooks. The sole secret is to discover your very own favourite amount and blend of spices! How to make the perfect Bobotie? Here’s how..
Heat up oven to 180C/fan 160C/gas 4. Add cold water into the loaves of bread and put aside to soak. At the same time, fry the onions on the butter, stir it regularly for about 10 minutes till they become soft and start to color. Add some beef and garlic and mix properly. Crush this mince into fine grains till it starts to change color. Mix on the spices, curry paste, herbs, sultanas, chutney and two bay leaves together with one teaspoon salt and lots of ground pepper. Cover up and cook for 10 minutes. Extract water out from the bread, then blend in the meat mixture well. Spill the mixture straight into an oval ovenproof dish (23 x 33cm and around 5-6cm deep). Squeeze the mixture down properly and smooth the top part. You could make this and cool one day in advance. For your topping, blend the eggs and milk along with seasoning, then put above the meat. Put in the top the remaining bay leaves and let it cook for about 35-40 minutes till the topping is ready and starts to appear golden.